With its upbeat attitude, bundles of humour, opportunities for good young actresses to show off their talents and, of course, a hip and adventurous soundtrack, it’s little wonder why Pitch Perfect became a cult sensation when first released in 2012. Sure, it may have been an archetypal underdog story that every competition movie uses from time to time, but it had so much fun doing that archetypal underdog story that it didn’t really matter. Luckily, for the majority of its fans from first time round, Pitch Perfect 2 is more of the same but never to a cynical degree like, say, the Transformers or Hangover follow-ups. It’s at least having fun with itself while doing it. Almost beat for beat (pun intended), it’s the same structure as the first film – it even opens, as it did previously, with an a capella version of the instrumental Universal logo followed by an embarrassing mid-performance mishap (in the first, it was a shock incident of projectile vomiting; in this, the genitalia of Rebel Wilson’s breakthrough character Fat Amy is revealed to the world – and an audience member who just so happens to be the President of the United States – in a blunder shortly after dubbed “Muffgate”). From there, it’s a long hill to climb once more for the downtrodden Barden Bellas as they compete in a competition to restore some dignity to their name, only this time the threat has more of an international flavour; that comes in the form of German troupe Das Sound Machine (appropriately nicknamed “Deutschebags” by the ever-articulate Fat Amy), who consistently give our heroes a run for their money. So yeah, the plot’s about as copy-and-paste as you could get, and it definitely feels more generic this time round because it’s a sequel and thus more open to attacks about originality. That being said, it takes some time out to address the power of contributing something original every once in a while, which is best personified by a new piece constructed by Hailee Steinfeld’s new recruit Emily, the daughter of a former Bella (Katey Sagel, aka the voice of Leela in Futurama), that is openly rejected by the a capella community, which uses primarily old tunes. You have to wonder if this is some kind of metaphor on the filmmakers’ part, as if a new and exciting original idea was shunned by the Hollywood business elite in favour of just sticking to what they know is successful without changing a beat (again, pun intended). It’s like the film is mocking itself, being a stock movie sequel with rehashed plot points that’s been made instead of something fresh and new that could easily excite audiences more than the Tinseltown big wigs probably realise – and in a summer with 95% of releases being franchise movies or sequels, it makes that message surprisingly timely. Either way, most fans will probably be going in for the musical renditions of popular songs instead of what’s really going on in the plot. These were some of the best parts of the first film, and they are what help this one truly shine too – from loud and bombastic a capella renditions of tracks like Miley Cyrus’ “Wrecking Ball” and Beyoncé’s “Run the World (Girls)” to quieter versions of past hits like “The Cup Song” – a song that became incredibly popular after its performance in film #1 – and even a mash-up of Christmas songs with Snoop Dogg/Lion/whatever animal he goes by these days singing “Winter Wonderland”, which is honestly something we never thought we’d hear until now. The only time the film abandons the vocal backing trend and just becomes a cheery musical that Mamma Mia oppressors will dread is a later duet with Fat Amy and her pursuer, the ever-coarse Bumper Allen (Adam DeVine), but even that is fairly downplayed and never over-the-top while staying true to its own brand of humour. It’s at times very funny, highly passionate when it decides to sing for us, and brings things to a complete-ish close that will satisfy its fans and anyone else who gets tagged along for the ride. Pitch Perfect 2 may not be wholly original, but like its predecessor it really doesn’t matter all that much. 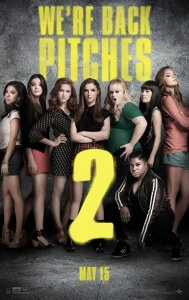 Pitch Perfect 2 offers more of the same for dedicated fans of the original, and although it follows the same structure to the letter (but even that might have smarter undertones than one might think), it’s still amusing and charming enough to get by with some corker musical segments sung by a talented cast.